Founded in 1969, the Danish multi-national BHJ group has had a UK factory and office in Hull, UK for many years, however they planned to move the production base to our nearby hometown of Grimsby. After a comprehensive meeting with the managing director, we made an analysis of their existing system based on their feedback and our experience, and we agreed that a modified version of our standard Vertical Plate Freezers would be the best solution for their state of the art freezing plant. Since most of the production is based around finely ground fish products, it was essential to maintain tightness of the freezers not only for hygiene purposes, but also to retain as much of the valuable product as possible. 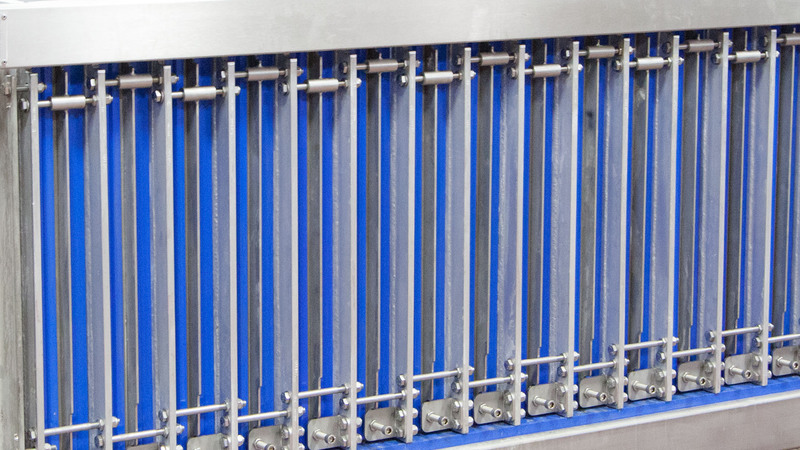 The Freezertech Vertical Plate Freezers where supplied with UHMW PE / Stainless Steel adjustable front spacers. These allow for critical tightness adjustments against the lifting arms to minimise potential drip loss for decades to come. 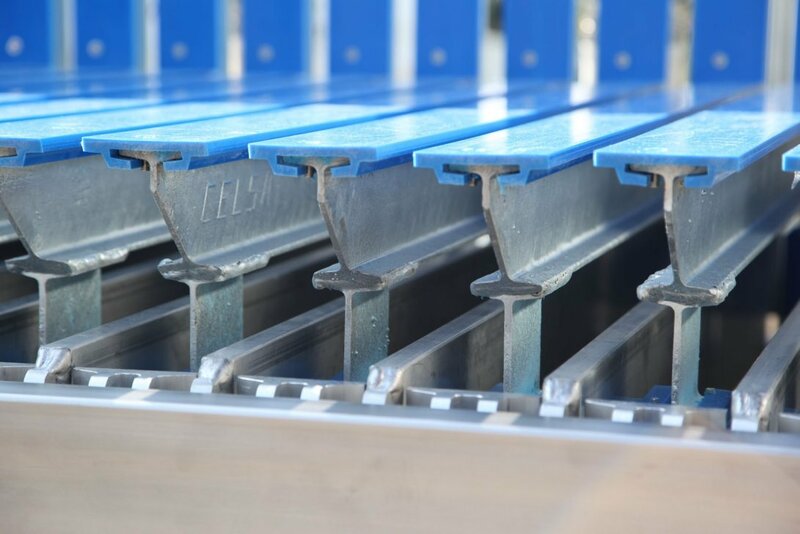 The UHMW Polyethylene cover material was perfect for reducing friction during unloading, especially with some of the stickier products being frozen such as ground Whitefish. The original system ran on R22 with 100mm thick blocks – although ok for its day, the system was showing signs of age and was no longer compliant with current EU regulations. We suggested using the natural refrigerant Ammonia due to its favourable thermodynamic properties, environmentally friendly status and low cost. 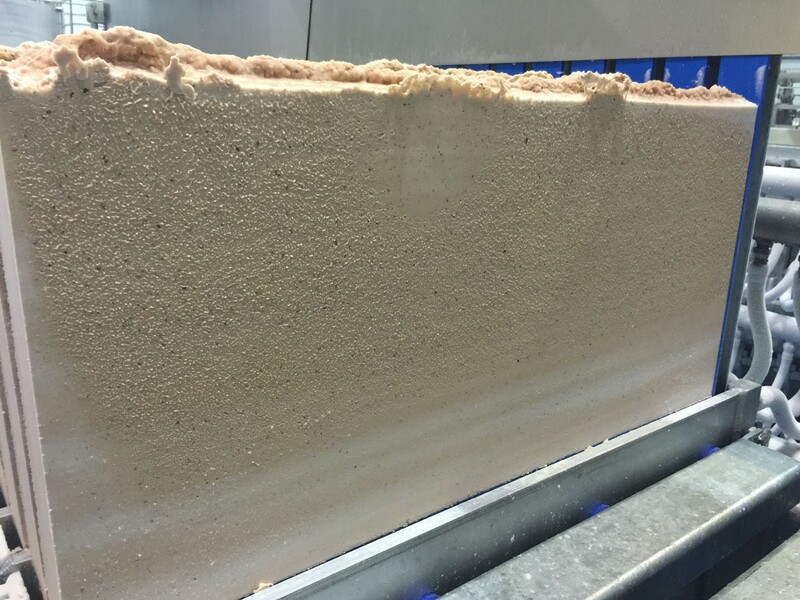 Since the product being frozen was ground & pumped, a 75mm block was chosen, offering the best balance between short freezing times and ease of handling. The old 100mm blocks took longer to freeze and reduced production, and typically 50mm blocks become difficult to handle and prone to snapping, even though they offer slightly higher production rates. 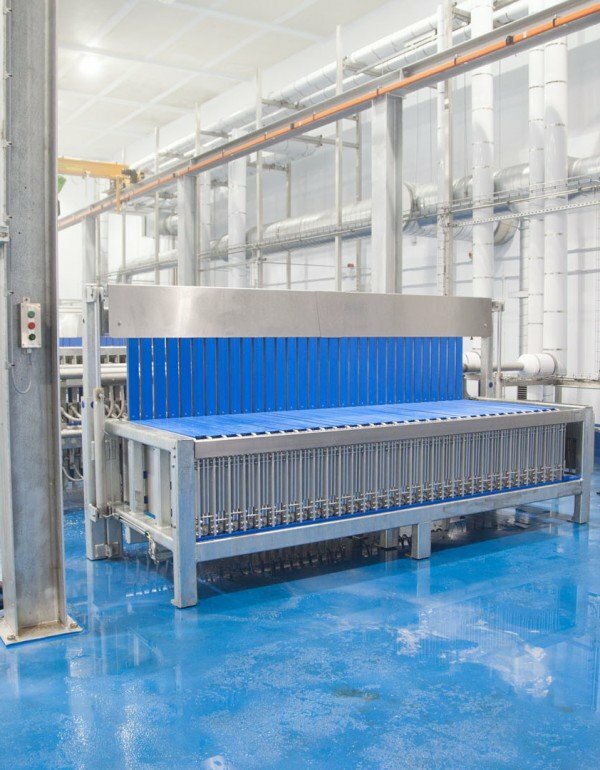 To help increase production, we supplied the Freezertech high capacity valve stations & electrical controllers along with the freezers. 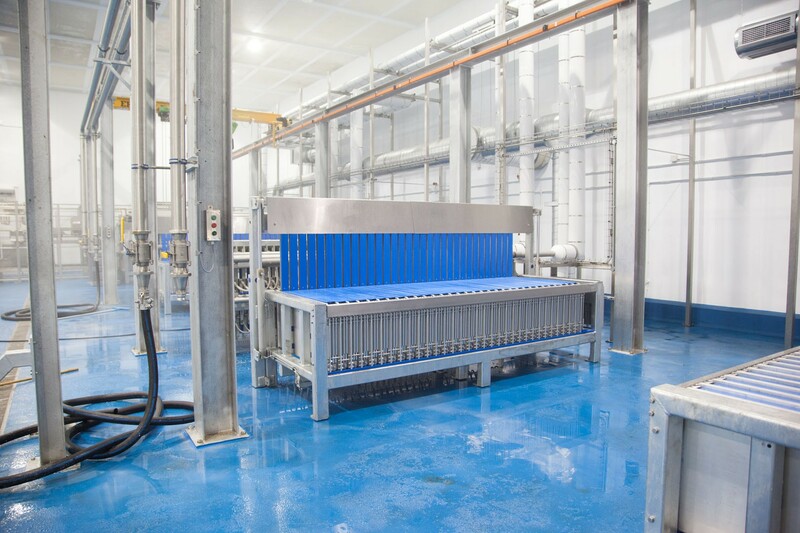 This allowed for the highest possible capacity at the lowest possible temperatures, and ensured the plate freezers would always operate at their best. 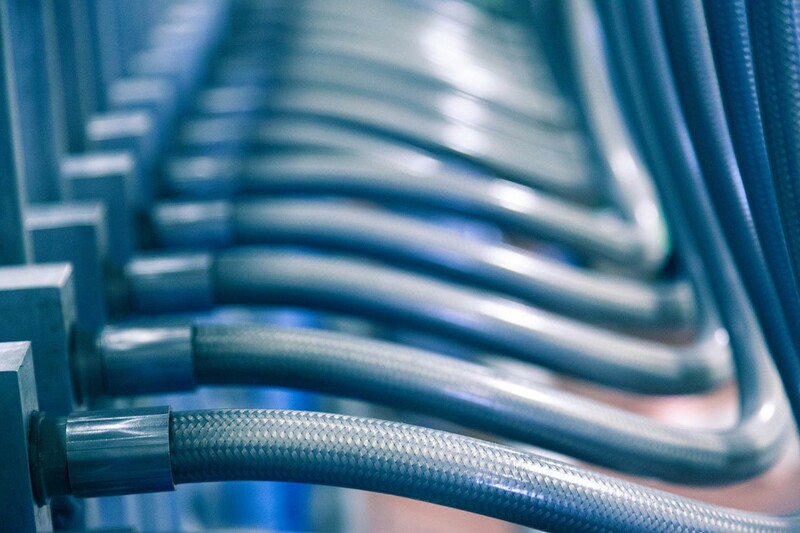 Since the valves had to be located in a roof void outside of the production area for safety reasons; special attention was paid to the wet return lines – we needed to ensure low pressure loss at the start of the freezing cycle where the load is high, yet not suffer too much from static head pressure later in the cycle as the load drops off. A combination of oversized valves & horizontal pipe runs was used along with a carefully calculated vertical riser to provide the best balance and shortest freezing times. The result has been freezing times of 90-95 minutes for ground Salmon blocks & 65-70 minutes for ground Whitefish blocks on a -40°C Ammonia system. One of the key difficulties with freezing ground Salmon in Vertical Plate Freezers is that, due to the oil content within the product; the Salmon actually freezes considerably below 0°C. When it came to defrosting, the old visual method of looking for fully melted ice on the outside of the plates was no longer good enough – this leads to over-defrosted blocks, which spoils product quality, and slows production whilst waiting for them to re-freeze before handling & palletising. Our unique high capacity defrost system was installed alongside temperature sensors placed in the freezing plates themselves. The combination of an low temperature, high speed (under 100 seconds) defrost along with the sensors ensures the product is defrosted properly for safe ejection, but is completely solid upon ejection, so no soft spots lowering product quality and no waiting for it to refreeze – the crane system could grab the blocks as soon as they were ejected. After many years of running older plate freezers, it was highlighted that some areas took a little longer to clean than they would have liked. BHJ benefited from not only our improved standard design, but we also supplied the VPF’s with an extra cleaning stroke to bring the lifting arms out of the plates – giving easy access for cleaning underneath, traditionally a hard place to reach. Our extended stroke system includes fitting the lifting arms with additional guide plastics to stop the arms swinging out of the plates when fully raised, and also includes a stop-sensor in the framework, so there was no risk of lifting the arms up too high during normal production. As well as our standard hygienic features, BHJ also chose to upgrade to our Silicone covered hoses on each plate freezer – which offer a more hygienic surface, as well as additional protection from any ice build-up during the freezing process. We’re seeing more and more push towards “assisted handling”, if not full automation in our field now and BHJ was no exception. Working with our food handling partner, we suggested an overhead crane for unloading each freezer fully at a time, and taking the blocks to an automatic palletiser. The crane system not only eliminates manual lifting and handling of the blocks, but also increases production speed, as the freezer can be re-filled and started again quicker. Although other options for assisted handling where available, ultimately the crane system was the best all round choice, and allowed for the freezers to be positioned in a compact, but still easy to access manner, saving valuable floor space. 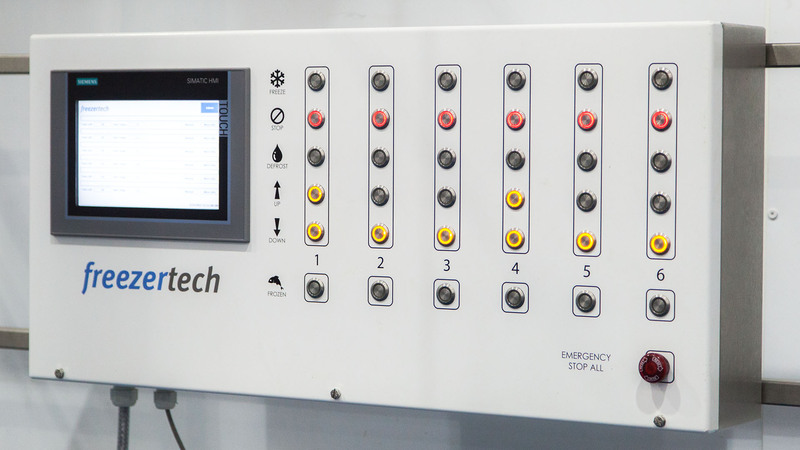 We must give a special thank you to HB Products – who kindly supplied us with several of their fantastic sensors to help adjust and confirm the best settings for the refrigeration & valve control. It should also be noted that this system proved at an extremely fast and efficient defrost could still be done on Ammonia (low differential pressure) whilst using small orifice nozzles for best freezing efficiency.